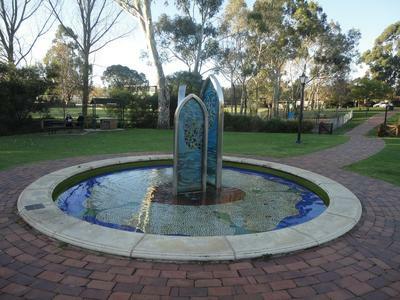 Hahndorf is located about 30 minutes south east of Adelaide and it is a beautiful and popular place to visit. The main street is full of interesting shops and cafes and the Alec Johnston Park is well placed, being roughly halfway along the street and just down from the wonderful toy store Misty Hollow. It is a great spot to have a rest after a hard days eating and shopping your way through Hahndorf. 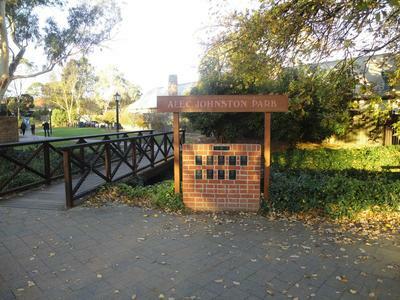 The park has all the basics; a big grassed area, toilets, a playground and it even has a small creek running through it just to make it a bit more picturesque and relaxing. Also available is a BBQ and tables so you can have a get together at the park and make use of the playground and great food that is so close by. 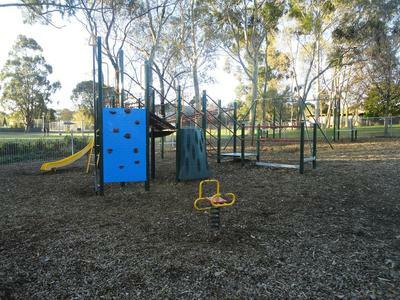 The playground equipment is fairly basic but it is enough for the kids to use up some of that stored energy from all of their treats or because they have had to be quiet while mum and dad looked at the shops. My son is 18 months and there is plenty that he can play on so while it does not have much to cater to really young kids, there is enough to keep them entertained. Surrounding the playground is a good sized grassed area that is perfect for a lie down if you just want to take it easy for a few minutes or, for a picnic if you have bought some tasty German food from one of the many shops along the main street. There are so many reasons to visit Hahndorf, you could take some friends to lunch at The German Arms Hotel, indulge your sweet tooth at Chocolate No 5 Café, or spoil the kids with a visit to Hahndorf Farm Barn but whatever you choose, the park is a great place to have a break and enjoy some of the sunshine.